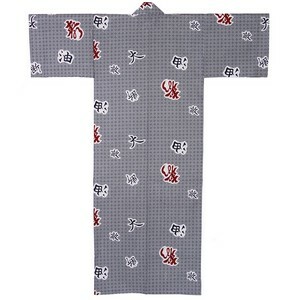 A comfortable ankle-length white cotton yukata with kanji from the four kanji idiom yudan-taiteku. "yudan" (overconfidence) "taiteki" (biggest enemy) can be translated as "carelessness is our greatest enemy" so the expression is telling us to be alert! Suitable for older child/petite adult of height 4ft8" - 5ft1". Please note back width is narrow (20").